Buying commercial real estate is just half of the equation. In order to produce an efficient, income-generating property, you need the best property management services Columbus, Ohio has to offer. You need the experienced team at The Robert Weiler Company. Successful property management means achieving perfect harmony – a balance between income and expense, between landlord and tenant, and between marketing and sales. To achieve this, we focus our time and effort on the best practices that ensure complete efficiency. And, rest assured that you have the best management team available, with the financial know-how, in-depth understanding of the market, and pure commitment that guarantees your property runs smoothly. Evaluation of the property: Detailed documentation of the property’s aesthetics as well as data on the accurate rental rates and recommendations for necessary improvements that could increase the property’s value. Marketing the property: Our team can help you prepare your property for rental, create ads to help market it, and work diligently to screen and select the right tenants for your property. Tenant management: From leases to move in, rent collection and even evictions, we are your partner when it comes to dealing with the tenants who may rent out your commercial property. Legal and financial advice: Years of experience in this industry means that we can offer you time-tested advice for all of your legal and financial needs. From the Ohio laws all the way to your tax obligations, we can help. Maintenance: If you ever find that you need to make changes or repairs to your property (or even remodel), our managers can oversee everything. We can assign the job, oversee the crew, and work with you to research the best pricing. We provide consultation, analysis and property management services aimed at generating a return on your investment and longevity for your real estate. As a commercial property owner, you have to be accountable for tenants as well as yourself. As your personal commercial property managers, we too can handle both sides of the coin. We work hard to maintain the potential of your property as well as your tenants’ satisfaction. Office: Personal, small, or corporate, we can handle any sized space, whether you are looking to lease, purchase, or expand. Retail: The Polaris Centers of Commerce® is just one of numerous retail developments we have managed over our history. Our goal… maximizing your ROI via strategic leasing and marketing tactics, which have proven effective time and time again. Industrial: 500,000 square feet? 1 million square feet? We can handle everything from leasing to development to marketing of your industrial property. Land: From single-family lots to shopping centers, we’ve specialized in the development and management of vacant land for sale in Ohio, transforming the landscape of Ohio into the residential and commercial haven it is today. Commercial: When you need commercial property assistance, you want the company with demonstrated knowledge and impeccable reliability – our competency and judgment has been successfully serving commercial buildings in Central Ohio for decades. Apartments/Multi-Family: Whether apartment complexes or condominium units, our team knows the work involved in these types of real estate investments. Our team handles all aspects, from the administration of tenants to the oversight of maintenance, leaving you with absolutely no worries. 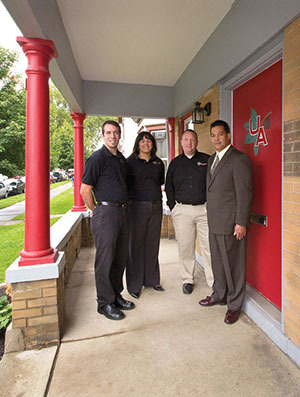 Since 1938, The Robert Weiler Company has been providing top-rated property management services in Columbus, Ohio and throughout Central Ohio. Call us today at 614-221-4286 to speak with one of our advisors. Find out how you can leverage our property management services expertise to help you achieve optimal management of your property.